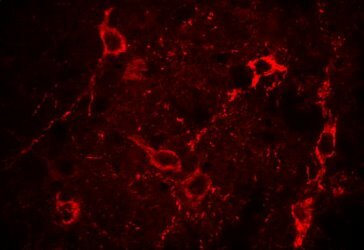 OB-Rb (CH14104) staining of 40µm free-floating rat brainstem fixed with 4% paraformaldehyde, HIER with Biocare Decloaker, 1:100 primary dilution, secondary antibody is Rhodamine Red-X, Donkey anti-Chicken (Jackson). Data Courtesy of Montina Van Meter (Dr’s. Rogers & Hermann - Autonomic Neuroscience Lab, Pennington Biomedical Research Center, Baton Rouge, LA).